Years ago, while volunteering at the BARC animal shelter, I adopted a beautiful brindle dog to a nice young couple. It was a great fit and he was a wonderful dog named Nero. They changed his name to Townes and several days later, I received an email showing Townes finally being able to stretch his legs out on some acreage – finally able to be a dog. It came with the caption: It was the best day of his life. And it clearly was. Fast forward to today. 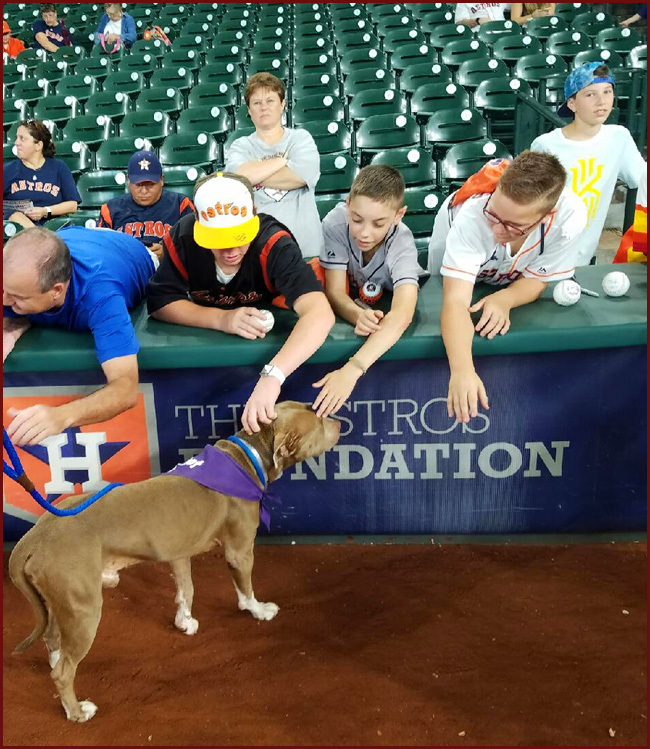 We decided to set up a table at the Astros Bark In The Park day at the Minutemaid baseball stadium. Dogs are allowed on this one special day and they get to parade around the infield. 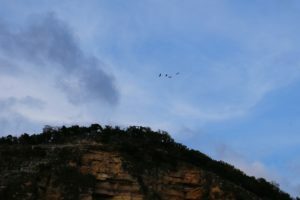 I have two rescue dogs – neither of which I could bring. Medina, a Mountain Cur, is too old and nervous. L.E., my Boxer rescue, doesn’t like other dogs – except Medina. I decided – why not take a shelter dog with me. It would be great PR for the shelter, I could get a dog out of its kennel for the day, and maybe, just maybe get it adopted. It was all so clear to me. I knew exactly which dog to take. I had just photographed her. A sweet, wonderful, beautiful little girl named Ivy. But then, a whole host of things happened. I thought for sure my plans to have a nice day at the ballpark would be ruined. Ivy had come down with an upper respiratory infection and was being treated with antibiotics. It’s nothing major. With all the dogs coming through the shelter, they spread germs like crazy. She would be fine but I couldn’t take her because we didn’t want to spread germs. 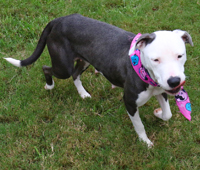 Plan B: A friend of mine was fostering a wonderful shelter dog named Molly. Molly needed a home so I decided to take her. Problem solved. Then fate stepped in. At the time, I didn’t think anything positive was going to happen. I tried to get in touch with my friend who had Molly, but there was no response. I had to get a dog. I couldn’t go to Bark In The Park without something that barked. The wonderful staff at the shelter was kind enough to let me take a shelter dog. Ivy couldn’t go so I decided to take Cedric, a very personable, charming, handsome, white dog who has the proclivity to sit on any and every chair he can find when he is commanded to sit. I knew he would be a hit at the ball game. But no, Cedric was offsite at a mobile adoption. Plan C: Big Lou! 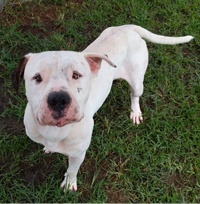 Big Lou is a wonderful white Bull Dog mix who was found wondering the streets of Houston. Big Lou is physically big, but his gorgeous, sweet, handsome head is about the size of a watermelon. Hence, the name: Big Lou. And he is gentle and calm. This would be the perfect choice. Everyone would surely love him. But Big Lou needed a bath, and I didn’t have time for that. So, no Big Lou. Plan D: Caden. 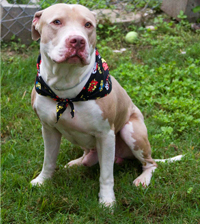 He is a beautiful tan and white Pitt Bull mix. Very well-behaved and very calm. He would be perfect. But Caden was in surgery, getting “fixed” so as never to be able to make puppies again. I was out of luck. I wasn’t familiar with any other dogs or they weren’t suitable to be around big crowds with lots of dogs. The last thing I wanted was to be stuck at the ball game with a dog who would be uncomfortable being there. And then fate dealt her hand. 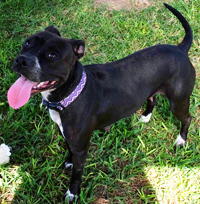 Right next to where Caden had been was a gorgeous Pitt Bull mix named Salvador. He has a beautiful tan coat. I met him several weeks ago and sadly, he is still at the shelter. He was sleeping in his bed and eye balling me. Could it be? Could he be the one? I opened his kennel and he got up and walked right to me. He stayed right by my side. I knew right away that he was very special. I walked him outside to do his business and he did. I got his vaccination records and walked him to my pickup truck. I’m not sure what country he’s from with a name like Salvador (I guess he could be from El Salvador) but it was obvious he had never ridden in a truck before. Welcome to Texas, Salvador. I hoisted him up in the front seat with me and away we went. By the way, he loves Willie Nelson music and loved riding in the truck. We got to the ballpark and he was as calm as can be. He loved everyone and loved every dog, except for the three that tried to bite him. Their bad behavior, not his. But he simply turned away and walked off. He didn’t care and was having none of that. Salvador was unflappable. Hundreds of people ran up to him to hug him and pet him. He just remained still – just like a service dog would. He could have been a service dog that day. The only response I ever saw from him was the big Texas-sized smile on his face. No, he couldn’t hide that. I even dropped his leash. He didn’t budge. He is truly special. Then we ran around the infield with hundreds of dogs and people bunched up together. No problem for this guy. He handled it like a champ. Dogs sniffed him and some barked at him. No response. Solid as a rock. 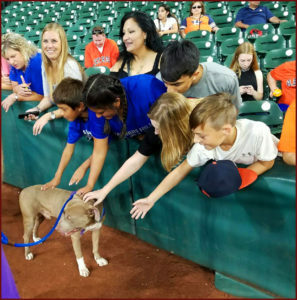 The real test came when people leaned over in the outfield stands and he had hundreds of adoring fans stretch their arms down to him to pet him. He simply walked over, stood, and was a perfect gentleman. I have never witnessed anything like this before. It was almost as if he were made for this sort of thing. If only my two goobers would act like this! But I can’t expect miracles. Speaking of which, if not a miracle, this was pretty close. If my friend had responded about her foster dog, I would have never taken Salvador. If Ivy wasn’t being treated with antibiotics, I would have never taken Salvador. If Big Lou didn’t need a bath (he got one by the way), I would have never taken Salvador. If Caden wasn’t getting surgery to get “fixed”, I would have never taken Salvador. You see, a lot of things needed to occur at just the right time for Salvador and I to connect. I believe in miracles and in fate. Do you? Everybody who met him fell in love with him. Two young ladies even bought him doggie ice cream with bacon toppings. He’ll probably have a stomach ache later but I bet he thinks it was worth it. And the ladies at Sunset Boulevard Animal Clinic couldn’t have been nicer to Salvador. He really liked them. And the staff at BARC couldn’t have been any better to him. And this may just blow your mind. Both Ivy and Big Lou got adopted to wonderful people. Had I taken either of them, they probably would have missed their chance with their new families. Freaky, right? It was the best day of his life. And now that fate has stepped in, we will make sure he has many more just like it. He deserves that. 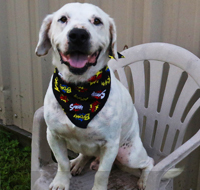 And at this time, he is still available at BARC #A1415452. 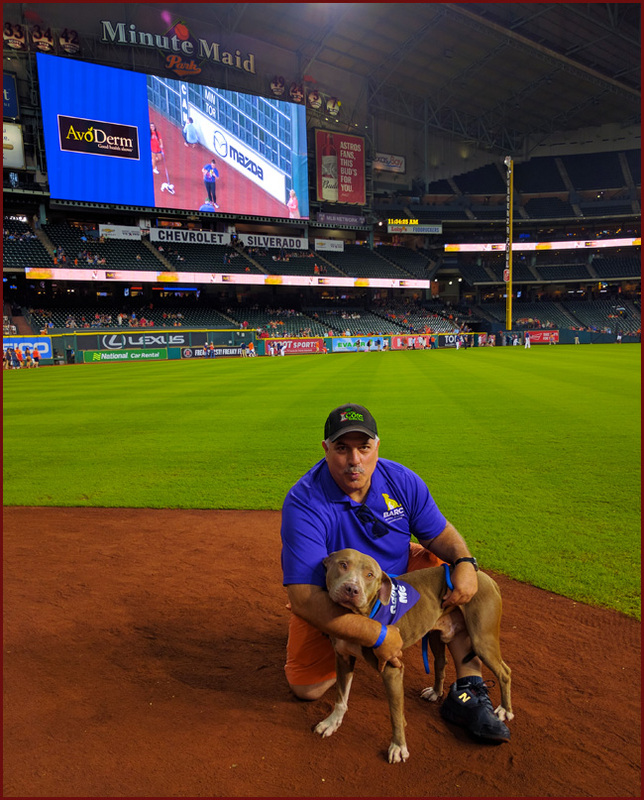 Check out this great video of Salvador at The Astros Bark In The Park. That’s a good looking dog! Oh, and thanks for making me weep AGAIN. Shelter dogs are like fishing. You throw your line in and you never know what you’re going to get. I was just lucky enough to be there. Hopefully Salvador will get a new home soon. Right back at you, pal.